For regular readers, this may seem like a repeat of recent themes, but there is a point which will become clearer as the new Shell scenarios are released later this week. “We will reduce the CO2 intensity of the economy by 30%. The question is, are these the right types of policies for solving the CO2 problem? There is no doubt that such approaches have gained traction and wide support from policy makers, but in many instances they are the result of a desire to solve a broad range of topical issues, ranging from energy security and energy access to jobs and economic growth. There is apparently then an underlying assumption that because each of these has a link with reducing emissions or low emissions that this must also be a solution to the real elephant in the room, the rising levels of CO2 in the atmosphere. This may not be the case. All of the above approaches appear to rest on the assumption that responding to climate change depends on managing the rate of emissions from the global economy, sometimes on an absolute basis but often on a relative basis, e.g. relative to GDP. But this doesn’t correspond with how the atmosphere sees our emissions of CO2. Rather, the rising level of CO2 in the atmosphere is ultimately a stock problem, meaning that what really matters is the total cumulative amount of CO2 that is released over time from fossil sources and land use change. Additional CO2 is accumulating in the ocean / atmosphere system at a much faster rate than it is being removed. The difference is several orders of magnitude when compared with its return to geological storage through processes such as weathering and ocean sedimentation, which is why in the context of managing the problem we can treat it as a stock issue or liken it to the rising level of water in a bathtub (where even a dripping tap will eventually result in overflow). By contrast, many other emissions to atmosphere don’t accumulate, they disperse, break down or drop out very rapidly. Over the last 250 years since the beginning of the industrial era, some 570 billion tonnes of fossil and land-fixed carbon (over 2 trillion tonnes of CO2) has been released, which in turn has led to a shift in the global heat balance and a likely 1°C of warming before the ocean / earth / atmosphere system reaches a new equilibrium state. An accumulation of a trillion tonnes of carbon equates to the 2°C temperature goal, but as a median within a broad distribution of outcomes, both higher and lower (Allen et. al., Warming caused by cumulative carbon emissions towards the trillionth tonne, Nature Vol 458, 30 April 2009). As long as the total fossil / fixed carbon released remains less than this amount over, say, a 500 year period, the climate problem is contained, at least to some extent. Thinking about climate change as a stock problem then changes the nature of the solution and the approach. Although emissions in 2020 or 2050 may be useful markers of progress, they do not necessarily guarantee success as they are measures of flow, not stock. 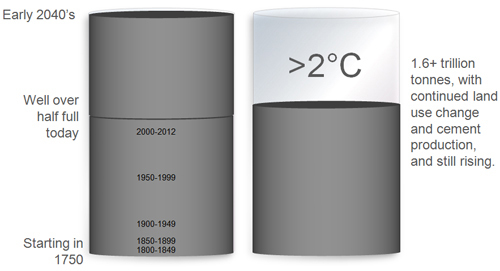 For example, meeting a 2050 global goal of reducing emissions by 50% relative to 1990 would be a remarkable achievement, but of only modest value if emissions then stayed at this level and the stock accumulated well beyond the trillion tonne level, albeit at a later date than might have otherwise been the case. Current global proven reserves of hydrocarbons (BP Statistical Review of World Energy) will release some 0.9 trillion tonnes of carbon when used, irrespective of how efficiently we might use them, how many wind turbines are built in the interim or even how many green jobs are created in the process. In combination with cement production and continued land use change, this will then take the cumulative carbon towards two trillion tonnes, with the likelihood of a temperature increase of well over 2°C. Not using these reserves and leaving them in the ground permanently (i.e. forever) so as not to contribute to the ocean / atmosphere stock will only happen if we develop alternative energy sources that out compete them, without subsidy or support, 24/7 365 days a year. Another way forward is to recognize that many economies around the world will choose to continue using the resources that they have, and therefore the focus should be on the development and deployment of carbon capture and storage (CCS), which returns the carbon back to the “geosphere” instead of allowing it to accumulate in the biosphere. CCS has the potential to address CO2 emissions on a scale equal to its production and at a cost that appears more than manageable by society. Most importantly, it fits the “stock model” thinking, which means that this particular solution matches the nature of the problem itself, rather than being a derivative of it. But as I have noted in previous posts, CCS is struggling politically to gain the necessary funding and momentum. There are no large scale CCS power generation plants operating in the world today, but only a tiny handful of industrial emission CCS facilities, with most under construction. New thinking and impetus will need to emerge to ensure that CCS becomes central to climate policy development, rather than it having to compete with the long list of other objectives that seem to prevail. The issue of accumulating CO2 in the atmosphere is a relatively simple one, which can’t be addressed by energy efficiency standards, renewable directives or similar such measures. They may impact on the short term consumption of fossil fuels in one region for a limited period of time, but they offer no guarantee of permanent reductions nor do they deliver a guarantee of a lower cumulative stock of CO2 over time – in other words, the fossil fuel that they displace locally simply gets shifted geographically and / or temporally (used later) such that the same accumulation of CO2 results. The CO2 issue is only addressed by two approaches – either leaving the fossil fuel in the ground forever or using the fossil fuel and returning the CO2 to the ground via CCS. Unfortunately, David has very simplified idea of this “stock” problem. The thing is that the capacity of the biosphere to hold carbon is extraordinary. There is currently circa 750Gt of carbon in atmosphere, 610Gt in vegetation, 1580Gt in soil, 1020Gt in surface ocean and 38100Gt in the deep ocean. Please note that there is 750Gt of carbon in atmosphere after mankind released 570Gt into it and the CO2 content in atmosphere has raised from 280ppm to 390ppm. Burning all known fossil fuel reserves would take us somewhere close to 600ppm whith most of carbon actually not going into the atmosphere but depositing elsewhere. It is apparent that the capacity of biosphere and especially oceans to absorb CO2 is enormous. Yes, it is bit slowly but it is getting better with increasing concentrations. IPCC also tries to convince us that CO2 in atmosphere has a power to significantly heat up the Earth. Well, it might be needed. In 16th century the Earth reached probably the lowest global temperature in the last 8000 years. The temperature over the most of the Holocene was at least the same and quite possibly much higher than today. I don’t know what caused that fluctuation but I’m glad we are back to “normal”. IPCC did a lot of damage when when they “invented” a hockey stick” which was promoted by Al “Jazeera” Gore. Although the hockey stick is discredited the popular knowledge still assumes that CO2 emissions are serious problem. Well, it might be but there is very little indication so far. After we have emitted 570Gt of carbon all we observe is just a “recovery” from unusually cold Holocene fluctuation. Even if we continue to recover at the same pace and continue to release carbon at the same pace there won’t be any significant effect on mankind for many decades, perhaps 100years. Over this one century many things might happen. We might even find that carbon emissions are serious issue indeed. Perhaps the reason why David has difficulty to persuade governments and people to give-up their cash for new shiny Shell made CCS plants has something to do with what I said. I believe you are correct in analyzing the issue of CO2 emissions as a “stock problem”. However, your assessment of our current situation is based on the outputs of the suite of climate models currently considered by IPCC, including the potential future temperature changed projected to be already “baked in” as the result of emissions which have already occurred. It should be obvious to you now that the outputs of this suite of models is flawed, in that there are things occurring in the real, measurable world which are not contemplated by the models. One example is the fact that there has been no change in the global average surface temperature anomaly in the past 16 years; and, no statistically significant change in 20+ years, on average. A second example is the fact that the global average surface temperature anomaly (adjusted temperature, not data) is below the lower confidence bound of the suite of models used by the IPCC. Recent papers suggest that as much as half of the reported anomaly exists solely in the adjustments, not in the underlying data. That situation is atrocious! The estimate of the incremental temperature change already “baked in” for the future is based on this suite of models and the sensitivities and feedbacks which drive their outputs. However, it is now obvious that the models don’t accurately model the real world. Rather, the measurable real world would suggest that the 2C “goal” (wish) is only about 25% full; and, that we might be on our merry way to 2C rather than 4C. I understand that it can be argued that it takes time for the climate to equilibrate, but that would also include equilibration to the evolving solar conditions as well. I have been waiting for someone, anyone, to enunciate a unique, broadly accepted goal for a program to “dodge” the CAGW “bullet”. If your are correct, that goal would have to be to reduce global annual CO2 emissions to zero with all deliberate speed, by some combination of zero emissions technologies and CCS. You are absolutely correct that efficiency improvements, increased vehicle fuel economy, hybrid vehicles, natural gas for power generation, etc. are not on the path to such a goal. I believe it is long past time for the climate science community to give up its pretentions. It is not the modern day, real world Rumpelstiltskin. It cannot weave straw (bad data) into gold (good data); and, it certainly cannot weave nothing (missing data) into gold (good data). We have collectively spent well more than $100 billion analyzing data that aren’t and building models that don’t. We do not know what the ideal global average surface temperature is. We don’t even know what the global average surface temperature is now. We certainly don’t know what the global average surface temperature will be in 100 years. I think the solution is clear – at least for me. We need to bring the accumulation of CO2 in the atmosphere to an end. This isn’t something we can do anytime soon, so we need to look at it as a century long project. The new Shell Energy Scenarios will be launched globally from Washington later today and I think they have an interesting story to tell in this regard. As far as the temperature record is concerned, I think we need to look further than just the air temperature. This is a system that is in three parts – air, ocean and ice. They won’t all change uniformly, but the fact that the sea level is rising and the Greenland and Antarctic ice caps are losing mass would indicate that there is still a heat imbalance in the system – i.e. more coming in than going out. David, I wish your trust in the sea level measurement (by satellites) and ice caps loss is based on knowledge rather than ignorance. Try to do some research on uncertainty of these measurements. This is a good starting point. Antarctica could contribute about 0.19mm/y (2cm/century) to the sea level rise – hardly detectable and hardly dangerous. Greenland is simply melting all Holocene. Nothing surprising for those who know that the climate (especially in Greenland) was warmer over the most of Holocene and melting will continue doing so until the next ice age. The best metrics to observe radiation budget of the Earth is the Ocean Heat Content. And this metrics is also rather flat at least from 2005 when the measurement was improved with ARGO floats. But the key point is bit different. The IPCC climate models predict acceleration of melting, heat accumulation, sea level rising, global temperature etc. Not mere linear increase. Linear increase is happening for 150 years and can go on for centuries without any ill effect. IPCC desperately needs exponential increase. Otherwise, we can just carry on depleting all proved fossil fuels deposits without causing any significant damage to the Earth. Yes, it is likely that there is lot more fossil fuel than what is proven in 2012 but it will take many decades or even centuries to exploit them. If the mankind won’t find better source of energy in several decades it might be wise to begin thinking about CCS. Not because we will fry, but because the CO2 concentrations beyond 1000ppm might start to be uncomfortable for some sensitive persons and organism. I hope that climate science of 22. century will know more than us who live in the dark age of climate science. In 100 years every first grader will know significantly more than any IPCC scientist of today. Interesting article, thanks for the reference. You are probably correct that proven reserves will continue to grow – technology will make more and more fossil energy accessible. But wait, this one is also very interesting. It looks like the Greenland ice sheet is much more resilient than some alarmist might think. It has survived much higher temperatures during Eemian period. So if Greenland has no real chance to melt excessivelly and Antartica’s melting is negligible what are the chances of dangerous (accelerated) sea level rise?